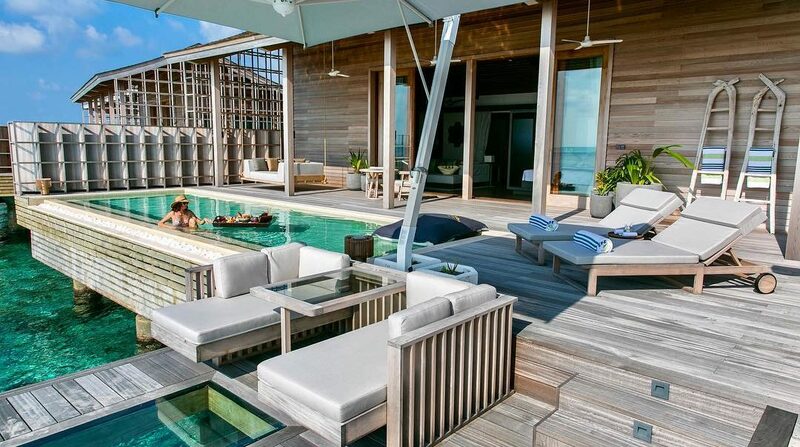 The newly opened Kudadoo Maldives Private island by Hurawalhi has become a highlight as the best luxury hotel. The private island is designed by renowned architect Yuji Yamazaki. Located just 40-minute seaplane ride away from Velana International Airport, Kudadoo is isolated from other islands and gives that remote island feeling to the travelers. This is the best escape for Travelers who seek privacy and luxury. An interesting fact about Kudadoo is that, the private island is 100% solar powered. Solar power generates sufficient energy at any given time to serve 50 guests and 100 staff. What’s there not to love about the island? Its environment friendly and naturally picturesque and not to mention, the resort relies on minimal single-use plastics. Kudadoo private islands accommodation can be selected from various available options. 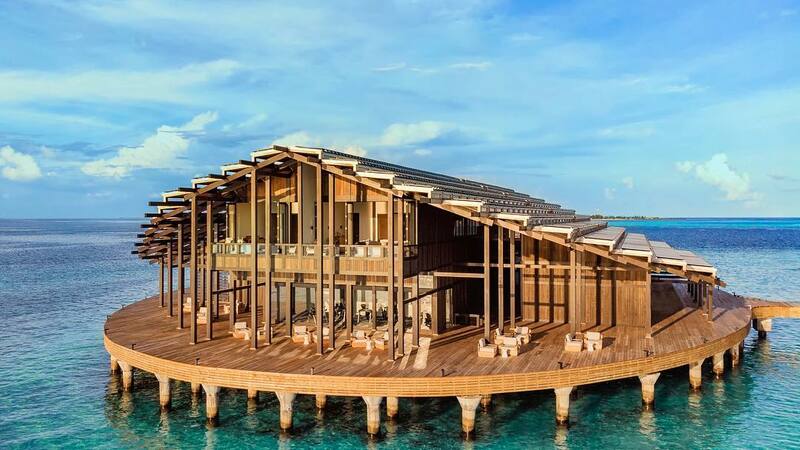 The private island has 13 one – bedroom ocean residences spanning 3,200 square feet and 2 two-bedroom ocean residences with whopping 9,000 square feet, and 15 over water residences. The spacious and elegant villas are furnished with well selected furniture and featuring with super king-sized beds. Each villa has private decks giving you the breathtaking views of the ocean. The decks have enough space for you to relax and sip cocktail on a sun-bed or do morning yoga by the sunrise. Besides, it doesn’t end there, the villas have large infinity pools that are long enough to swim laps. Another interesting fact of Kudadoo is that the restaurant serves “Unscriptive Dining,” meaning you can choose anything to eat, whenever and wherever you want. The restaurant relies heavily on locally caught seafood. The heart of Kudadoo is The escape, home to a restaurant, a bar, a wine and cheese cellar, an infinity pool, a gym and a spa, and an upper deck with conference facilities for corporate retreats or meetings with clients. As many people spend the day out at sea and dine in their villas, it never feels crowded. And if you fully rent the island, The Hideaway is where everyone gathers for events. Kudadoo’s Sulha Spa is a real treat, and is conveniently situated above the ocean. While a therapist soaks your foot, you can enjoy the stunning views of the ocean as you relax in your chair. The spa uses products by healing earth, an African brand, which produces coral-friendly skin care that contains natural and organic ingredients. The menu ranges from traditional facials and massages of deep tissue, Reiki, Zen Shiatsu, as well as a gong sound shower and Tibetan singing bowls. Kudadoo is an escape for adults who are seeking tranquility. Excitement, peace and extraordinary services awaits your visit. Luxury resort Kanuhura Maldives rolls out its festive program, which includes bespoke festive options for luxury travelers. Highlights of the Christmas and New Year high season include gourmet dining across its eight restaurants and bars culminating in a stunning poolside Christmas Eve gala dinner and a Great Gatsby-themed New Year’s Eve party on the beach complete with live band, DJ and fireworks at midnight. The New Year’s Eve party dress code is white tie, ball gown and bare feet for better dancing the night away in the sand. A champagne bar in the sand will be in full flow, as will the team of 35 kitchen chefs who’ll be cooking up a range of gourmet temptations from locally caught lobster and seafood to the finest foods from around the world.